Only 25 Jackets CreatedThis exact version will not be made again. NOTE: Model in pictures is wearing a different version to show how it fits.Why We Made ItCool jackets for kids that are not only unique and stylish but add tons of fun when going outside. Now she can collect the precious finds of the day and make a mission out of it.Features 11 special pockets for her treasures in pink, fuchsia denim along the scalloped hem. Plus 2 big pockets on each side for her hands. Treasures pictured are not included. Fully lined in silky and soft Poly Charmeuse. We love the orange, yellow, turquoise, pink, turquoise, and blue floral print. The outer layer is fleece in royal blue and deep purple. 2 oversize whimsical buttons that are easy to fasten, she can do it herself. Each jacket has a different combination, each button is fabulous. 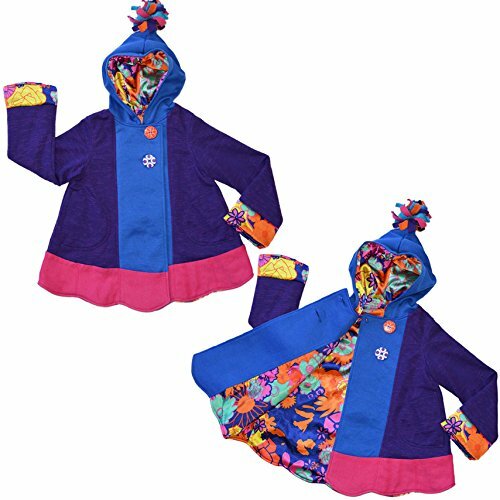 A hood with a handmade colorful tassel - so you can find her when she disappears to find something special.Details Super soft fabrics, no itchy seams. Machine washable. Line dry. Polyester blend fabrics. BOUTIQUE GIRLS DRESSES & SKIRTS. Durable, high quality, over-lock stitching for everyday wear. UNIQUE STYLES. All our super soft twirly dresses and twirl skirts are fun, pretty & comfortable. EASY CARE. Everything from our girls party dresses to our twirly skirts are machine washable. MADE IN THE USA from imported and domestic fabrics. Created in small quantities like works of art. GREAT CUSTOMER SERVICE for all our cute little girl & tween dresses, skirts, tops and bottoms. If you have any questions about this product by TwirlyGirl, contact us by completing and submitting the form below. If you are looking for a specif part number, please include it with your message.